Our Gems of Arabia tour group arrive about three hours before our flight leaves the Dubai airport at 11PM, so we have plenty of time to get through the check-in process and find our gate. The flight to Atlanta takes 16 hours and 4 minutes according to the pilot. I see the aurora out the aircraft window over Denmark and take some photographs. Oddly enough, by the time we fly over Greenland, the aurora is gone. 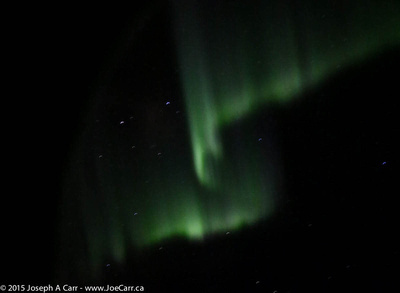 I then briefly spot bright aurora again over Newfoundland. It is 6:25AM (3:25PM Dubai time) when we land in Atlanta. I quickly clear customs and immigration, since Atlanta has the same kiosks for US and Canadian citizens to use as SeaTac. Dealing with a customs agent after that only takes a few seconds, and then I reclaim my bag and say my goodbyes to the tour group. The sign outside says “Hotel Shuttles – call for pickup”, however what actually happens is that a shuttle transfers everyone from the international terminal to the domestic terminal, where the hotel shuttles are located. I wait here in Atlanta for tomorrow’s flight to Seattle and then to Victoria by overnighting again at the Hyatt Place Atlanta Airport-South hotel near the airport. They don’t have any rooms available when I arrive at 8AM, since people are still having breakfast before they check out. I check my big bag and wait in the lobby while sipping on a cappuccino, so I’m relatively happy. After my room is ready, I have a shower and then draw the drapes and sleep for about 6 hours. I order some dinner and a cappuccino and take it back to my room, and then go back to bed and sleep through to 5am. I had a good sleep at the airport hotel, but get up early since I’m still not fully adjusted to the time zone change from Arabia. I kill a couple of hours in the room, and then go down for breakfast and also have that essential cappuccino. I then return to my room and put in some time on the computer. I make some good progress on my travel photos. I decide to kill time at the airport, rather than pay for a late check-out, so I leave at noon and have to sit around in the domestic terminal until 3PM, when Alaska Airlines will allow me to check my bag. I then have a bit more freedom, so clear security, ride the train to my terminal area and find my gate. Atlanta airport is certainly a great deal bigger than the last time I flew through it. There are two main terminals (domestic and international), and each of those terminals are huge in their own right. The Alaska Airlines 737-900 appears at the gate on time, and we board on time, but then the screw-ups start. First up is rearranging the luggage in the hold, and then they pull back into the Jetway to let a passenger board. Apparently his dogs made it onboard in cargo, but he didn’t make the connection. The airline decides it is quicker and easier to pull back in to board him rather than send his dogs on ahead of him. I guess there is a first for everything! The pilot previously told us they would have to de-ice before taking off, and so after we pull away from the gate, the aircraft taxies over to a designated area for deicing. I remember from previous flights that deicing took place at the gate, but obviously ATL has different protocols. By the time all this transpires, we are an hour late leaving. It’s a good thing I have 2 hours and 15 minutes layover in SeaTac. As it turns out, I have plenty of time to find the gate at SeaTac for the flight to Victoria, which is in a different terminal. Alaska Airlines announces Victoria airport is experiencing foggy conditions, so they will attempt to land, but if the flight crew doesn’t feel it’s safe, we will return to Seatac for an overnight stay. The weather is fine when we land in Victoria. My bag is one of the first to appear on the belt, I clear customs and immigration, take a taxi home and go to bed by 1:30AM. My trip to Arabia is over! We drive from Muscat, Oman back to Dubai, U.A.E. today. We are staying in the new section of Dubai at the Manzil Downtown Dubai hotel. This is perhaps the poshest hotel we have stayed at on the whole trip, and when I check out the room rates, they start at 1,400 AED (CD$400) per night. There are multiple concierges in the lobby, all eager to be helpful. I have dinner in the hotel restaurant this evening, since I don’t feel too adventuresome. The boneless beef ribs in date sauce with french fries are very tasty, and I chase it down with a Tiger beer. Service is impeccable. Cost is AED130 (CD$43) – about what I would pay for a nice dinner at home in Canada. Today is a free day to do what we want in Dubai, since our flight home doesn’t depart until 11PM. We have a late check-out from the hotel at 6PM. Last night I booked a ticket for the Burj Khalifa’s observation deck (140AED or CD$50). When I initially went online, the standard tickets were booked until the mid-afternoon, however when I selected having a cappuccino and a cake for 15AED more, I suddenly had my choice of time slots! So this morning I navigate my way through the Dubai Mall to the observation deck entrance at 9:30AM. 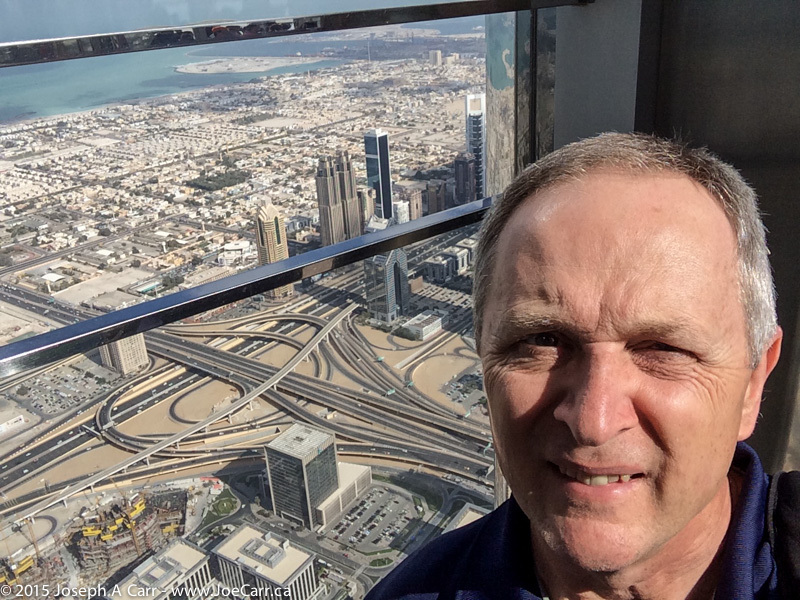 The elevator zooms up to level 124, and I experience the tallest building in the world! There are inside displays and an outside deck. Although the deck is glassed in, there are gaps in the glass so photographs can be taken without window reflections. As I sip my cappuccino and pastry from the coffee shop below, I gaze up a this imposing building. It is visible from virtually anywhere in the city of Dubai, and casts its shadow for blocks. Most people on the tour are shopping in the Dubai Mall, which is right across the street from our hotel. Since I’m not into shopping and I’m feeling it’s time to return home, I spend the afternoon in my hotel room packing, napping, cruising the Internet, and annotating my many photographs from the trip. Our bags are picked up at 5PM and we depart the hotel at 6PM for our farewell dinner. The restaurant is near the airport, and the food is underwhelming, so I won’t mention the name. I guess we have been spoiled with all the good food we have had on our tour. Our flight leaves the airport at 11PM, so we have plenty of time to wait. The flight to Atlanta will take 16 hours and 4 minutes according to the pilot. I get up a bit earlier this morning, since we are leaving early for the long drive north to cross the border into Oman. The breakfast buffet is very extensive, and they have cappuccino, which is always a big bonus in my books! Before leaving Al Ain, we stop at their camel sale this morning, where there are hundreds of camels in sheds and open air pens, as well as sheep and goats. It is fun watching the haggling, but I finally go back to the bus early to get away from the heat and the smell. Kais tells me even city people buy camels and keep them outside the city, in order to maintain their connection with their culture…and no doubt some race them. We drive along the expressway to the outskirts of Dubai, and then north to Ras al-Khaimah. Here we drive along the coastal highway to the border crossing, and leave both our UAE guide and driver. The border crossing process takes awhile, due to some confusion which I don’t fully understand. Our Omani driver and guide meet us, and we drive the beautiful and scenic highway along the Musandam coastline to Khasab. Before we check-in to our hotel, we have a late lunch or early dinner at the Al Shamaliah Grill and Restaurant in the New Souk Area of Khasab. Since it is Friday, everyone is being called to evening prayers – the whole town is filled with wailing sing-song broadcast from the minarets on the mosques. Our hotel is the Atana Musandam, built right next to the harbour, and it is right next to a LuLu Hypermarket (like our supermarkets). The Musandam Peninsula is separated from the rest of Oman by the east coast of the UAE, and is in a very strategically important location with the Strait of Hormuz separating Oman from Iran. Iranian smugglers pick up goods (mainly household appliances and cigarettes) in Khasab early every morning and zoom across the strait to customers in their country. 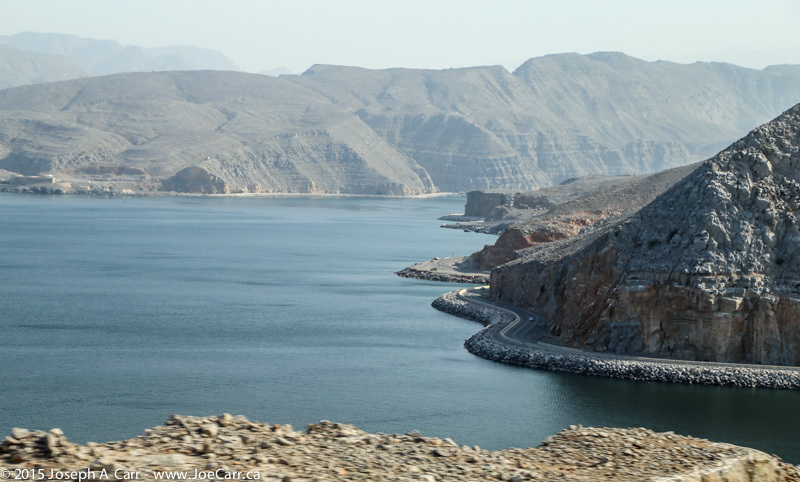 The Musandam Peninsula is very arid and rocky, but features beautiful khors (rocky inlets), small villages, and dramatic, mountain-hugging roads. We leave early this morning for Al-Ain, so I gulp down some breakfast and coffee before boarding the bus. We drive down the main highway back to the outskirts of Abu Dhabi and then take a freeway to Al-Ain. It takes over three hours for the trip with one rest stop. The highways and expressways in UAE are superb. They have all been built within the last twenty years, so they are in great shape, and support high posted speeds. The interchanges and ramps rival or exceed any found elsewhere in the developed world. After arriving in Al Ain, we have some time at the Sheikh Zayed Palace Museum. This was the residence of the sheik who unified and created the United Arab Emirates. I find it fascinating to walk through the formerly private rooms, and ask myself “if these walls could talk”. In particular, the Private Majlis meeting room must have seen some pretty important discussions during the unification process. We go for lunch to nearby Foodworld Restaurant, which was a very nice meal. They handle our group of twenty and our drivers very promptly. Our final stop for the day is the Al-Ain Zoo. I’m not a big fan of zoos at the best of times, although this one has large enclosures for the animals. It appears they have a mix of indigenous species to the Arabian Peninsula, and also have some exotic (mainly big African) animals. Our hotel in Al Ain is the Al Ain Rotana. This is a five star hotel…very posh. This is obviously the place to stay in Al Ain, since I see a couple of cars with government plates on them (a crest and three digit number). Despite this, our tour leader Michele has some trouble to contend with before we are all settled in our rooms, however I won’t publish the details online. I find my new room to be quite luxurious…too bad we are only staying one night! Today we go on an early morning sunrise sand dune 4×4 adventure, and then again for sunset. Several vehicles get stuck in the sand, but eventually the drivers get them out either by towing, pushing, or rocking them. The morning sunrise is the most rewarding, since the light was just right, and our guide finds a relatively pristine location with no vehicle tracks or footprints visible. I found hanging out during the midday at the Liwa Hotel to be very enjoyable. Several of us take advantage of the very nice pool at the hotel, which we have to ourselves. I have a nap in the afternoon, and then catch up with my journaling while drinking a cappuccino in the lobby bar. We visit a nearby camel farm in the late afternoon. Camels are used for meat, milk, and racing, and every Emirati family seem to own a camel, even city dwellers. One of our tour group samples the camel milk – a brave man, since there is no refrigeration. The evening sand dune 4×4 adventure is not very rewarding and it actually ends up being pretty stressful. The light at sunset is totally flat, and the wind is up causing sandstorm conditions. Our driver misses taking the correct track along one of the dunes, and we end up stopped, right on the edge of a big hole. I get out and climb in the soft sand to the top of a dune to watch, as do my two vehicle mates. The expert is called, and drives the 4×4 out with pushers behind. Our guide Kais rides a snowboard down a sand dune, which is fun to watch! We leave our Dubai hotel this morning to drive along the coast to Abu Dhabi, largest of the emirates. 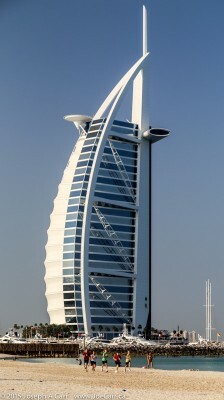 First stop is along the beach to photograph the iconic sail-shaped Burj al-Arab hotel. Unlike yesterday, the sky is blue and the haze hasn’t had a chance to gather, so we all get some good photos. Our next stop is the Sheikh Zayed bin Sultan al-Nahyan Mosque (Grand Mosque), and it is indeed grand! Some of the women on the tour are hassled about not covering up enough when we arrive, but that is soon sorted out, and we enter the mosque. This is my first time inside a mosque. The floors and walls are decorated with beautiful inlaid flower patterns, and the main prayer hall has the largest silk carpet in the world (handmade in Iran), as well as the third largest chandelier in the world. The outside of the mosque is all white marble, and the inside is also marble. The whiteness of the exterior hurts my eyes in the noon sunshine, even while wearing sunglasses. The Men’s Ablution (washrooms) are palatial – I take a photo! Members of my tour group who have visited the Taj Mahal tell me this mosque is grander…but who really knows? We leave the coast and drive 240 kms into the desert to Liwa Oasis. There are villages and farms in this remote area, which hugs the edges of Saudi Arabia’s Empty Quarter. We arrive a bit too late for our planned sunset 4×4 drive through the sand dunes, so that will be put off until tomorrow. I’m happy to have some down time at the Liwa Hotel this evening. It appears this hotel is the only accommodation of any consequence in this sleepy little village. I’m awakened by the 5:30AM call to prayer outside. I sleep a bit longer and then go to breakfast at 7AM, since we depart on tour at 8AM. The buffet breakfast served downstairs is great: lots of choices, freshly made hot and cold food, very good coffee, and great table service. We meet our local guide Kais (or Qais) this morning as we board our bus outside our hotel. He is Tunisian, but has lived and worked in Dubai for the last 10 years with his wife and daughters. This morning, we walk along the Creek in the historic Bastakia Quarter, which has souqs and some fascinating displays of Emirati culture. The Ruler’s Court is located in this area, which is where the sheik still receives delegations of local people. Vendors in the souqs in this area sell spices, gold, perfume, and more. We take an abra (small taxi boat) to cross the Creek, and have lots of time to explore all the nooks and back alleys – it’s like a shopping mall full of specialty shops! We have lunch alongside The Creek at Al Bandar restaurant. We have a variety of salads, hummus & another spread, pita bread, grilled lamb sausage and chops, chicken chunks, vegetables, french fries, and non-alcoholic beverages and water. Fresh fruit is served for dessert. There are some scrawny small cats lurking around, loudly begging for table scraps. Our guide Kais smokes a hookah, and one of our group tries it too. 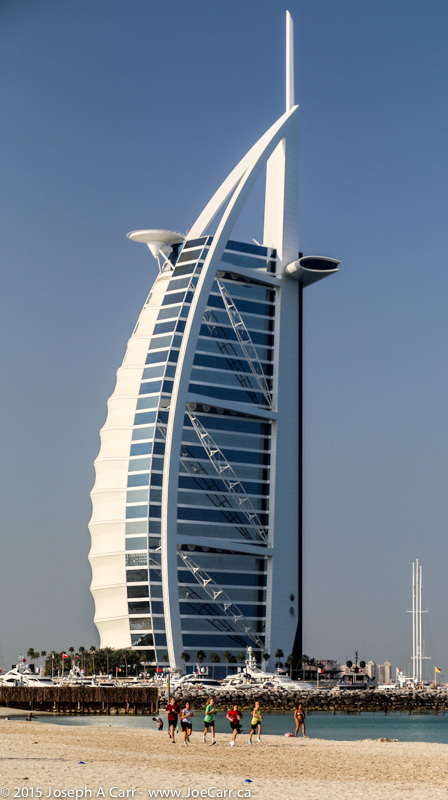 This afternoon we photograph the lovely exterior of Jumeirah Mosque and later drive through the ruling family’s residential area, making a stop at the famed Burj Al Arab hotel, supposedly the only seven-star hotel in the world. Driving out onto the Palm Jumeirah Island reveals a world unto itself: lush homes (all waterfront), very posh shopping districts, high end business offices and towers, and a still developing resort complex. Rush hour traffic back into the city means it takes well over an hour for our final stop of the day in New Dubai’s Marina District. This is a superb example of beautiful modern architecture combined with futuristic urban planning – a dream come true for architects and community planners. We leave after the sun sets to return to our hotel, the Arabian Courtyard Hotel. By this time, most of us are sleeping in the bus due to jet lag. There are only 950,000 Emirates citizens. The rest of the 9 million people living in the UAE are foreign workers. When asked on CNN why Dubai is so “over-the-top”, the current sheik states that he feels it is his obligation to give his people the very best of everything possible. Dubai is one of several sheikdoms in the United Arab Emirates. Dubai only gets 5% of the oil revenues of the UAE, but is traditionally a trading centre, and specializes in transportation. The Dubai port and airport are the biggest hubs in this area, and support extensive business interests both here and abroad. I’m out the door at my home and in a taxi to the airport by 4AM. The United counter Victoria airport opens at 5AM (2 hours before flight time). Once my bag is checked through to Atlanta (US$25+tax), I clear security and grab a cappuccino from the Spinnaker’s On The Fly restaurant in the boarding lounge. My flight for San Francisco leaves at 7AM, so I have some time to kill. Once the flight to San Francisco departs on time I can relax, since there is nothing further I can do about anything except find my gates at each airport along the way. I’m flying through San Francisco and Houston to get to Atlanta today. I only have an hour to find the gate in Houston for the final leg to Atlanta, but I catch a break. The flight arrives on time, the aircraft isn’t full so unloading goes well, and the next gate turns out to be in the same terminal. So instead of rushing around, I have a few minutes to spare. Atlanta’s domestic terminal is under construction, and is a mess both inside the terminal buildings and outside with the access roads. I finally find the hotel shuttle and arrive the Hyatt Place at South Terminal. This hotel is a pretty good choice. Although the room fixtures are starting to show wear and tear, check-in is quick, and it is clean, quiet, and well-run. Today is a lazy day to start with, since my flight to Dubai doesn’t leave Atlanta airport until 9:45PM. I have a leisurely breakfast in the hotel lobby, fool around on the Internet for awhile, and then go for a walk in the sunshine along a local bike trail. I pay the hotel an extra charge so I can stay in my room until 6PM, since it makes no sense to spend an extra half day in an airport when I’m facing a 14 hour flight later today. I have a shower and sleep in the afternoon, and put on some fresh clothes before catching the airport shuttle at 5:30PM. The shuttle takes me to the domestic terminal parking area, where I have to transfer to the International terminal shuttle, which takes a good 20 minutes. I remember Atlanta airport being big, but not quite this big! I check in at the Delta self-serve kiosks and give my tagged bag (Dubai-DXB) to the check-in clerk. Since I am “TSA Pre-cleared”, I breeze through security and onward to the concourse and find our gate by 7PM. An hour later I meet the tour group near the gate for the flight to Dubai. Of course it is a blur of introductions; names I will not remember for a few days yet. Boarding is disorganized, and it is a full flight on a Boeing 777-200SP. I purchased Economy Comfort in order to get an additional 4” of legroom and more seat recline, so I am in the Group 1 boarding. It’s nice to get onboard ahead of about half of the passengers for this 14 hour direct flight. The captain announces we will arrive in Dubai a few minutes ahead of schedule. 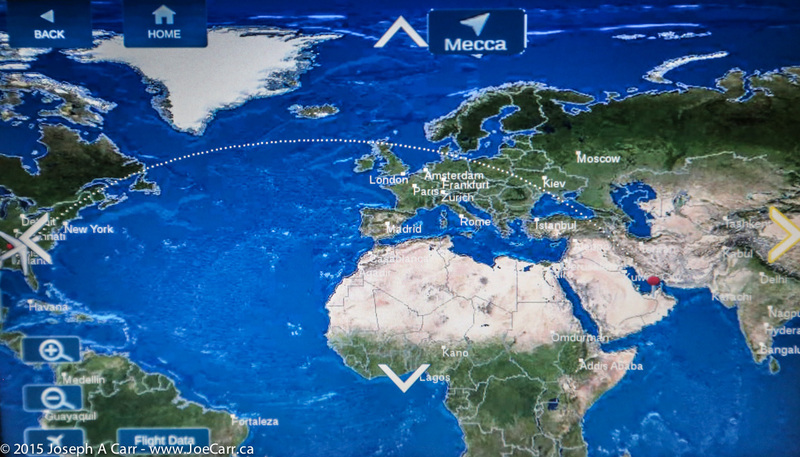 Our route is up the Atlantic coast, past Newfoundland, south of Greenland and Iceland, and over Western Europe. Let’s hope we steer clear of Syria on our way down to Dubai! 7AM (Azores Time) I take a guess at the time zone as we are south of Iceland when the Sun rises. Sunrise over the North Atlantic is spectacular from my SE-facing window seat, and of course I take lots of photos since I’m such a sucker for sunrises and sunsets. I’m the only one with my window shutters open, but I can’t sleep and want to look out the window. We are served a cold breakfast bun and some coffee, and then everyone goes to back to sleep, except me of course. A flight attendant comes by and asks me to close one window and keep the other one half-shaded, so I finally give up and close them both and try to sleep as we fly over Europe. Now I’m sitting here typing this journal entry in the dark cabin while it’s full sunshine outside as we pass Sicily, crossing the Mediterranean on our way to the Middle East. Four hours and 15 minutes to Dubai. We are now 1 hour 50 minutes from Dubai, flying across the Arabian Peninsula. The cabin is still dark despite it being early evening outside…bizarre! We are served another meal before our 9PM arrival in Dubai. The airport is controlled chaos as our group retrieve our bags and walk at least a kilometre (no people movers) to clear immigration, and then wheel our bags out to the waiting bus. We are staying in the old part of the city at the Arabian Courtyard Hotel, which is an older hotel, but I like it. My room is very nice, they have a couple of restaurants and a bar, and the location is ideal for shopping and sightseeing.